Although EOR is a major user of HLD, the oil industry uses it in many other applications. The selection here give an idea of how useful it can be. The page on Oil and Contamination Removal focussed on the huge area of EOR (Extended Oil Recovery). This is a $multibillion area where getting the right surfactant blend for the oil, salinity and temperature is vital. At the time of writing that page I was unaware of the many other uses of HLD-NAC within the oil industry, inclding fracking, so I am grateful to Gianna Pietrangeli (whose HLD expertise was developed in the Salager research group at Universidad De Los Andes in Venezuela and who is currently at Flotek Industries) for providing a list of her publications with her colleagues at Baker Hughes that span a wide range of applications in the industry. If this one team at one company can cover so many different aspects of the oil industry, imagine how widespread the use is across other teams at other companies. The "before" (top) and "after" (below) pictures (courtesy of Baker Hughes) show just one example of the use of HLD-NAC. The mucky fluid coming out of the pipe at the top, and covering the tank (or 'pit') with muck is a typical drilling fluid. The "after" image is fluid with a microemulsion package used to clean out the well. It has sufficient remaining cleaning power to also clean the pit. Who cares about this? I am told that cleaning the pit (to avoid contaminating the drilling fluid) was a nightmare task involving solvents and high pressures. Now it gets cleaned during the well-cleaning process, simplifying life in the hectic and time-pressured oil well environment. Because not everyone has access to papers in SPE (Society of Petroleum Engineers) I have cited the Abstract of each paper along with the standard SPE short reference. Efficient removal of the drilling fluid from tubulars, screens, and near-wellbore mineral surfaces is essential to the successful completion of wells. Cleaning and removal of the non-aqueous drilling fluid (NADF) from all of the well surfaces is not an easy task. Microemulsion fluids provide a highly successful solution to this problem. Carefully designed and customized microemulsion fluids have been used to remediate and increase well productivity and injectivity in wells located in the Gulf of Guinea. Due to their uniform wellbore cleanup, optimum results were achieved in open-hole horizontal and highly-deviated wells. The robust microemulsion fluid systems are capable of accommodating changes in temperature, density, and salinity. They restore the water-wettability of the rock and increase injectivity or productivity of the wells. Some water injectors and oil producers from the Gulf of Guinea exhibited low injection or production rate. The purpose of pumping the treatment downhole was to improve injectivity by removing skin damage and screen blockage by using in-situ generated microemulsions, thus allowing efficient oil production from the formation or water injection at sustainable high-injection rates into the formation. Field data shows that injectivity and productivity increased after treatment. In some cases, the downhole pressure decreased for the injectors. Cleanup and removal of the NADF from the Gulf of Guinea wells was beyond the capabilities of conventional treatments. Laboratory tests confirmed that the in-situ microemulsion treatment removes the damage and helps to achieve the desired and predicted injection and production rates. This paper presents field data, before and after the successful microemulsion fluid treatment, and describes various laboratory tests performed prior to the Gulf of Guinea field applications. In-situ formation of water-in-oil emulsions in crude oil is one of the severe problems encountered during the production phase of oil wells. These in-situ emulsions produce crude oil viscosities that are much higher than the viscosities of native crude oil. It is well known that these problems are frequently found in heavy and extra-heavy crude oils, because these oils have significant amounts of carboxylates and naphthenates, which are polar molecules that are excellent stabilizers of water-in-crude oil emulsions. These in-situ emulsions form in the reservoir and in the near-wellbore regions. However, when the crude oil is produced to surface, they may also develop at various downstream locations such as at wellheads, pipelines, separation plants, and even at the refinery before processing. The major factors that determine the formation of in-situ emulsions are the crude oil/produced water ratio, properties and composition of the crude oil and connate water, and some reservoir properties such as temperature. Demulsifiers are traditionally used to prevent the formation of in-situ emulsions. These treatments are generally effective. In situations where the demulsifier chemistry cannot change the curvature of the oil/water interface, the emulsification problem persists, with inherent consequences such as loss of production, high-pressure drops in flow lines and increased operational costs. A solution to treat these troublesome emulsions is to use microemulsion fluids technology. Microemulsion fluids typically have very low oil/water interfacial tension and can alter the interfacial curvature of the emulsion, producing coalescence and increasing water droplet size until the emulsion separates into water and crude oil. This paper discusses the evaluation of microemulsion fluids as a treatment for emulsified heavy crude oil samples from oil fields. The evaluation includes crude oil characterization, interfacial tension, microscopy evaluation, fluids compatibility tests and treatment of the emulsion in an HPHT filtration cell. Many different types of crude oils are extracted from Mexican reservoirs, and most of the crude oils from the northern region are heavy crude oil with API gravity between 15 and 20. Many fields in this area are mature and have been intervened as long as 50 years ago. As a consequence, the identification of the damage and selection of the right treatment is challenging for those wells. Furthermore, the type of completion used does not allow the use of production assemblies for intervention. Traditional treatment techniques consist of reverse circulation using coiled tubing. In the first treatments, the majority used hot oil in cycles and BTEX solvents. Several of the interventions were not successful, and the logistics process was complicated. In some cases, the treatment led to asphaltenes deposition and emulsion blockages in the near-wellbore region. Mesophase fluids based on microemulsion technology are a viable alternative remediation system for wellbore cleanup when low-producer wells experienced intervention. The fluids are carefully designed, have ultra-low interfacial tension, high oil solubilization, and good compatibility with formation fluids. They can be used to mobilize trapped fluids and solids in damaged wells, remove water blocks and in-situ emulsions, to name a few of their benefits. After many applications in Mexico and other countries, experience shows this fluids technology leads to more productive oil and gas wells because they can be remediated or protected from damage. Mesophase fluids are differentiated from conventional technologies by composition, their mechanism, and application. These novel fluids have low or no aromatics content or other solvents and easily diffuse through the formations. The application of the technology involves a carefully designed treatment train based on pills. The pills circulate from the annulus to the string assembly or reverse circulate to displace the fluids rapidly. The treatment is pumped close to the pay zone, with a radial fluid invasion of 1 to 2 feet into the formation, and then is allowed to soak overnight. More than 20 applications confirm the success of this technology in remediating heavy crude oil wells. In some cases the production increased by a 100%. Mesophase technology for wellbore clean-up and remediation in the drilling industry has been used in various oil fields to increase well productivity and injectivity. The majority of these applications include oil-based mud filter cake removal, near-wellbore remediation, and wellbore displacement. The open hole wells completed with standalone screens in the deepwater tertiary formations offshore West Africa have benefited from previous knowledge and experiences accumulated by the operator and the service company in the application of Mesophase technology in other fields. This paper discusses the field application of the Mesophase technology in several deepwater offshore fields in West Africa. Previous to the field application, the Mesophase formulation was customized for the field conditions, such as temperature, fluid density, type of completion brine, and specific oil-based mud. The customized formulation was evaluated to determine the regain of injection permeability, fluid compatibility and the breakthrough time. Intensive tests were required to fine-tune the formulation to obtain the desired high-injection permeability for the challenging conditions encountered in the field. Results from the laboratory and description of the field application are discussed and presented in this paper. The field applications data proved that, after placement of the mesophase treatment in the wells, diffusion of the treatment produced: (1) break-up of blocking solids from the completion screens; (2) removal of filter cake residues; and (3) water-wetting of all solid surfaces. 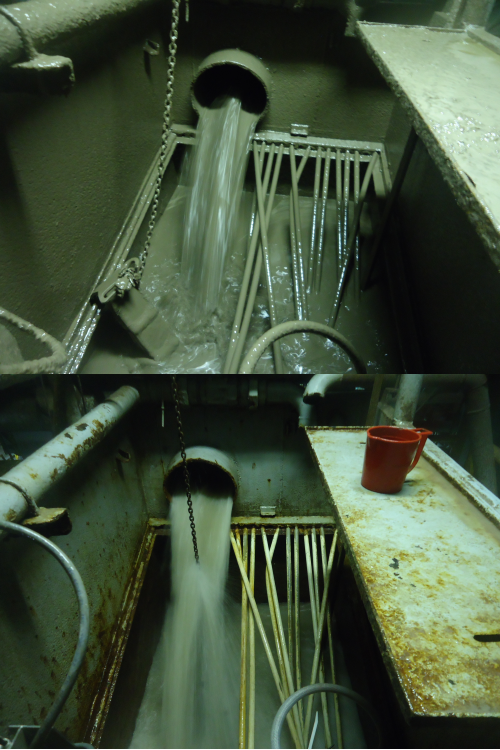 This cleaning treatment gave very good results in the production and water-injection wells. Applications of microemulsion technology in the drilling and production industry have increased in recent years. Some of these applications include oil-based drilling fluid displacement to water-based fluid, near-wellbore remediation, well stimulation, enhanced oil recovery, flow-back recovery in shale gas wells, and cement spacers. Microemulsion formulations for these applications need to have high oil solubilization and very low interfacial tension, which is achieved with relatively high concentration of surfactants. High-performance microemulsion systems with lower surfactant concentrations are desired in order to optimize the cost of microemulsion technology applications. The reduction of surfactant concentration and cost could be achieved by introducing linker additives in the formulations. The addition of linker molecules enhances the solubilization property of microemulsions, which increases the hydrophilicity and/or the lipophilicity behavior of surfactants. Previous studies indicate that addition of a proper linker molecule could significantly increase the solubilization of the oil. The lipophilic linker molecules (e.g. long chain amines, acids, alcohols, phenols) increase the interactions between the surfactant and oil, although with some disorder to avoid formation of highly-organized structures and to decrease the viscosity. This paper provides a comprehensive discussion of work carried out to determine the influence of lipophilic and hydrophilic linkers in microemulsions formulated with anionic/nonionic surfactant blends. The interfacial tension, fluids compatibility, and return permeability evaluation of microemulsion formulations containing lipophilic linkers prove that these additives bring a significant improvement in water injection or crude oil production. In recent years, applications of microemulsion technology have increased in the drilling and production industry. Some of these applications include oil-based drilling fluid displacement to water-based fluid, near-wellbore remediation, well stimulation, enhanced oil recovery and flow-back recovery in shale gas wells. Microemulsion formulations for these applications need to have high oil solubilization and very low interfacial tension, which is achieved with relatively high concentration of surfactants. High-performance microemulsion systems with lower surfactant concentrations are desired to optimize the cost of the technology application. 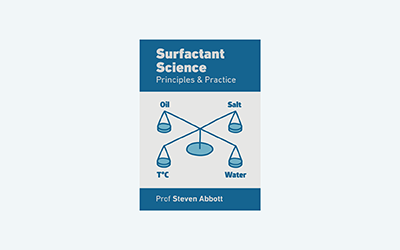 The reduction of surfactant concentration could be achieved by introducing linker additives in the formulations. The addition of linker molecules enhances the microemulsion solubilization property, which increases the hydrophilicity and/or the lipophilicity behavior of surfactants. Previous studies indicate the addition of a linker substance could double the solubilization of the system by segregating at the interface. The linker molecules create chaos, avoid formation of organized structure and decrease the viscosity, which helps to pack surfactants more efficiently at the interface. Some examples of linker additives include amines, acids, alcohols and phenols. This paper presents systematic studies that have been carried out to determine the influence of lipophilic and hydrophilic linkers in an anionic/nonionic surfactant mixture when exposed to olefin-based oils that are used in synthetic-based drilling fluids. The results of the study include phase behavior of a microemulsion system, interfacial properties and kinetic diffusion under several temperatures, as well as evaluation of the system with and without the addition of linker molecules for cleanup of synthetic and oil-based drilling fluids. Decreases in hydrocarbon production can be attributed to depletion in formation pressures or flow restrictions caused by formation damage. Some of the most common causes of formation damage affecting permeability include the buildup of in-situ emulsions due to crude oil interaction with drilling and completion fluids, water blockage, asphaltene and paraffin deposition and alteration of near-wellbore wettability. In new wells, near-wellbore formation damage may be caused by emulsion blockages when the whole mud, mud filtrate or completion fluids interact with the formation fluids. Chemical treatments have been widely used to remediate damaged formations, with varying degrees of effectiveness. Single-phase microemulsion fluids provide unique properties that can effectively remove emulsion blockages, remove precipitated crude oil macromolecules, and reverse wettability to enhance hydrocarbon production. Carefully designed microemulsion systems having an ultra-low interfacial tension, high solvency and compatibility with formation fluids can be used to mobilize fluids and solids in wells. This paper discusses the process of developing and qualifying a single-phase, temperature stable microemulsion system for field applications. Case history results are presented that demonstrate how this technology, if applied properly, can significantly enhance hydrocarbon production in poorly producing wells.